MANCHESTER – 1st April 2019: Hot and spicy flavours are maintaining their popularity in new food launches, while recent years have also seen the concept of “extreme” heat take hold in a number of categories. In this month’s Insight By Gama Compass we look at how hot and spicy flavours are impacting different areas of the food sector, as well as some of the new and unusual concepts that are pushing the boundaries of heat sensation. 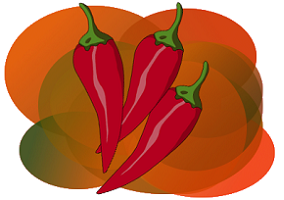 Spicy heat is a long established element of food innovation and, as the latest figures from Gama Compass demonstrate, spicy and chilli flavours remain resolutely popular in new food launches all across the globe. In 2015, 3.7% of all food launches reported by Gama had a “hot” or “spicy” flavour, while the figure was 3.9% in 2016 and, after dipping back in 2017, 3.9% again in 2018. Broadly speaking, spicy flavours are largely designated by the simple term “hot” or “spicy” (1.1% of all food launches between 2015 and 2018), but more commonly by being more specifically identified as “chilli” – 2.0% in the case of food launches recorded in 2018. At the category level, hot and spicy flavours stand out mostly in sauces and seasonings, but also have significant penetration in snacks, ready meals and, increasingly, in a number of other areas of the food industry. Perhaps unsurprisingly, sauces and seasonings remains the leading category for hot and spicy launches, with in the range of 9-11% of launches over each of the past four years featuring a spicy flavour, while the proportion of snack launches with a hot or spicy flavour has varied between 6.6% and 10.4% over the same timeframe. “For 2019 and beyond, there are no indications of a significant downturn in popularity in chilli flavours across the food and drinks space”, commented Gama editorial director Tom Warden. “Instead, all the signs are that manufacturers will continue to use chilli in creative new ways to challenge consumer taste buds through extremes of heat, flavour sophistication and category diversification”. Read more on trends in chilli flavours in the current issue of Gama News.